There is a lack of data on trends in body composition among developing countries and the distribution of malnutrition among adults is poorly understood. 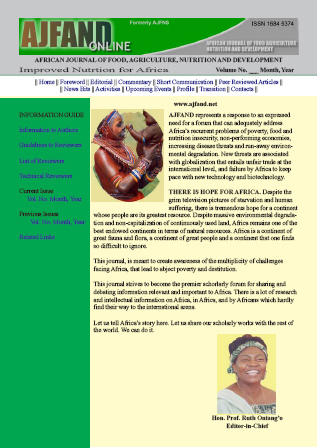 Thus, the objective was to establish nutritional status, demographic make-up, dietary habits, and to determine if socioeconomic variables or dietary habits are associated with nutritional status in a rural adult Kenyan population. Five hundred Kenyan adults ages 18-55 years were recruited from the Kombewa division, located 40 km west of Kisumu, Kenya. The proportion of underweight and overweight adults is consistent with developing countries in nutrition transition. Using standard body mass index (BMI) classifications, 9.8% of the study population was underweight, 76.0% were normal weight, and 14.2% were overweight or obese. Significantly more females (20.7%) were overweight or obese than males (4.1%) (P=0.001). Iron deficiency was a significant issue, with 21.4% of females classified as anemic (Hb<120g/l). Among overweight females, anemia rates remained high (16.9%) and were greater than in underweight females (10.8%). While 20% of subjects were HIV positive, their status did not affect BMI (P=0.230). The most significant correlation between dietary data and BMI was french fry consumption (r = 0.167, P=0.001). Overweight or obese subjects reported eating french fries more frequently than subjects who had an underweight or normal range BMI (64.8% vs. 43.8%, P=0.002). Several other socioeconomic and dietary variables had weak correlations with BMI. Similar to data from developing countries in nutrition transition, it appears that the nutritional status of this rural Kenyan population has been affected by shifts in dietary patterns. Based on trends in other developing countries, it is likely that the incidence of overweight will increase in Kenya while micronutrient deficiencies and underweight remain concerns. Socioeconomic variables have been correlated with nutritional status in other developing countries and should be examined further in conjunction with food insecurity, so that culturally relevant and feasible interventions can be implemented.